If your TV is anything like my TV, it is regularly tuned to PBS Kids. "Curious George" is a must-see on our screen, but I have a feeling George is going to have to make room for a new little critter in our hearts: Daniel Tiger. PBS is premiering "Daniel Tiger's Neighborhood" this coming Monday, and my kiddos couldn't be happier. Last week, we watched a sneak peek of the entire first episode -- Click here to watch it, too! -- and my 2- and 4-year-olds haven't stopped asking for it since. And for those of you who grew up watching "Mister Roger's Neighborhood," you're going to love the show, too! It is truly a walk down Memory Lane for this child of the '70s and '80s. In honor of little Daniel Tiger, I've created a fun snack for you and your kiddos to share while watching the show. 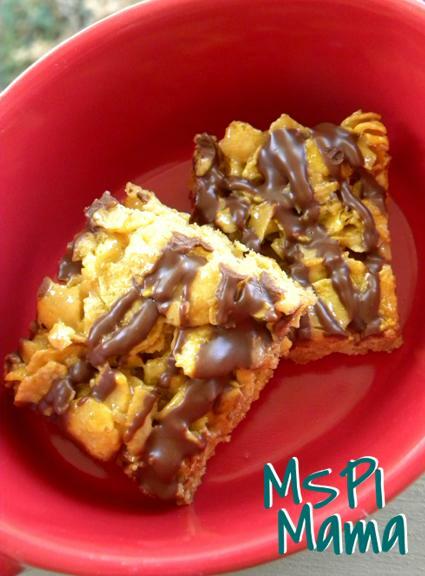 It's a twist on peanut butter crispy treats. Feel free to use sunflower seed butter, if peanuts are an issue for you. Now I dare you not to hum "It's a Beautiful Day in the Neighborhood" while munching on one of these gooey bars of yumminess. In a large microwave-safe bowl, heat the marshmallows and margarine, stirring every 30 seconds, until melted, about 2 minutes total. Stir in 3 tablespoons peanut butter until melted. Stir in the cereal until fully combined. Coat an 8x8 baking pan with cooking spray. Spoon the cereal mixture into the prepared pan. Coat your hands with cooking spray, then press the mixture firmly into the bottom of the pan. Set pan aside while the mixture cools and firms, about 30 minutes. Meanwhile, place chocolate chips and 2 tablespoons peanut butter in a small bowl. Microwave on high, stirring every 30 seconds, until melted, about 2 minutes total. The chocolate mixture should be smooth and pourable, if it needs to be thinned out, stir in 1-2 teaspoons of shortening to the mixture. Once the pan has cooled, drizzle the chocolate mixture in a stripe pattern across the top of the cereal mixture. Set pan aside to allow the chocolate to cool and firm up. Cut mixture into bars and serve. Tip: Many brands of corn flakes have cross-contamination issues with soy. If you can't find one that's safe for your family, substitute a crispy rice cereal -- the bars will still be yummy, just not tiger orange. Tip2: This recipe can easily be doubled. Just use a 9x13 baking pan instead. I have to ask but how do you find shortening that doesn't contain soy? unless you use palm oil shortening that is very hard to find. Since shortening doesn't contain soy protein, many people on the MSPI diet can eat it without problems, however, for those who can't have soy oil, I recommend palm shortening. If you can't find it in your local store, you can purchase it on Amazon. I have some that I purchased from www.tropicaltraditions.com, as well. They occasionally run free shipping specials, which makes it a little easier on the pocket book. Nice snack idea. Will have to go and see if we are also going to get this show, the kids will love.